The KKLD has made a reappearance in the iTunes store. It was mysteriously pulled about 2 years ago when it was originally published by Enfour. At the time I wondered if there was a rights dispute over the electronic version. Did Casio have exclusive rights perhaps? We’ll never know. Now it’s being published directly by CJKI. Unfortunately they see it as a new product so I’d need to stump up £15 if I want it. I think I’ll wait until my current copy breaks under after a system upgrade. It now has iPad support and the SKIP search system has been improved, although I think SKIP is past its best-by date. Multi-radical is better suited to computers, or direct drawn input on iOS. 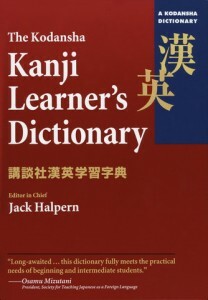 It’s an excellent kanji dictionary however and despite its relatively expensive price for an iOS app it’s a bargain compared to a print edition. I recommend it. Hi, Thanks for introducing KALD for iOS. Note that the Enfour edition was published illegally — they are now being sued — and is full of bugs. Neither the publisher nor we gave Enfour permission to publish. Our version is far superior in a every way so I recommend that you try it. Best of luck in your studies. Thank you for commenting. Rather audacious of Enfour in what is quite a small field (quality English Japanese Dictionaries) even including a endorsement “by you” and keeping and acknowledging the various copyrights. It looked pretty official. I’m very glad KALD is now officially in the App Store, it’s my favourite Japanese – English dictionary. … I wonder if Apple will give me a refund?